Sealoc takes advantage of the exceptional features, brilliant wide-viewing picture and incredible sound of the LG 6-series TV and transforms it into a wonderful, weatherproof outdoor theater experience. The Coastal Silver series uses patented exclusive conformal nano-coating technology, previously only available for military, aerospace and medical use, to make the internal electronics and components IP68 waterproof and protected from chemicals, salt-air, extreme temperatures and high humidity. Coastal models are fully weatherproof, with silicone sealing anywhere water could potentially get in and a 3M wrap that covers the edges, sides, top and bottom. The bright, high quality UHD display is calibrated for optimum outdoor visibility, making it perfect for viewing in almost any condition, even capable of handling heavy rain directly. The 50 inch 4K IPS screen features a thin bezel and the upscaling technology converts lower-quality SD, HD or full HD content to near-4K level quality. Improved picture clarity and reduced motion blur are provided by the 120 Hz motion rate technology. The webOS smart TV technology allows you to queue movies and TV shows from multiple content providers and alternate between them. Wi-Fi connectivity is built-in, and the TV is compatible with Amazon Alexa and Google Home devices. HDMI and USB ports allow you to share music, movies and photos. All Sealoc Coastal outdoor TVs are further weather-proofed with adjustable neoprene input covers, so you can make use of inputs without worry of damage from the elements. Ultra Surround sound gives you an immersive sound experience from seven virtual channels that require only the built-in speakers in the TV. TV includes VESA mounting pattern in order to be easily compatible with standard TV mounts. Sealoc TVs have a suggested operating temperature range of -14 to 140 degrees Fahrenheit. Includes a remote control with nano-coating and power cord. 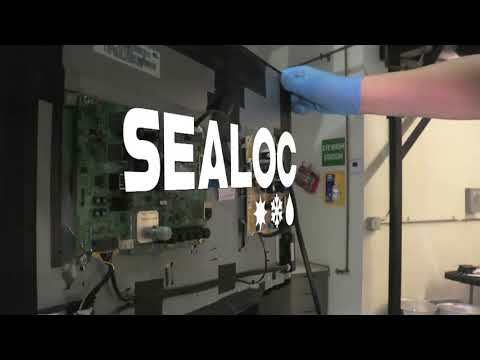 Sealoc warrants that all TVs that are made by Sealoc have a prorated three (3) year limited warranty that is free of defects and workmanship from the time of purchase. Sealoc Outdoor TVs are covered under a limited warranty that begins on the original date of purchase, and is valid only for the original purchaser, and only for TVs that were registered within ninety (90) days of the purchase. See manual for full warranty information. 49 1/2" 49 1/2" 49 1/2" 49 1/2"